Where is Kiwanis Park in Tempe? Kiwanis Park is located in Tempe, Arizona. The park is about 125 acres and includes the Kiwanis Recreation Center, a tennis center, batting cages, a lake where you can fish, baseball diamonds, soccer fields, volleyball courts, picnic areas and more. The Kiwanis wave pool is one of several places in the Valley of the Sun that offers lap swimming all year long and this indoor pool hosts special events during the year. In addition to standard sports fields, ramadas and playground, Kiwanis Park also offers a batting range, horseshoes, tennis courts, urban fishing and volleyball courts. 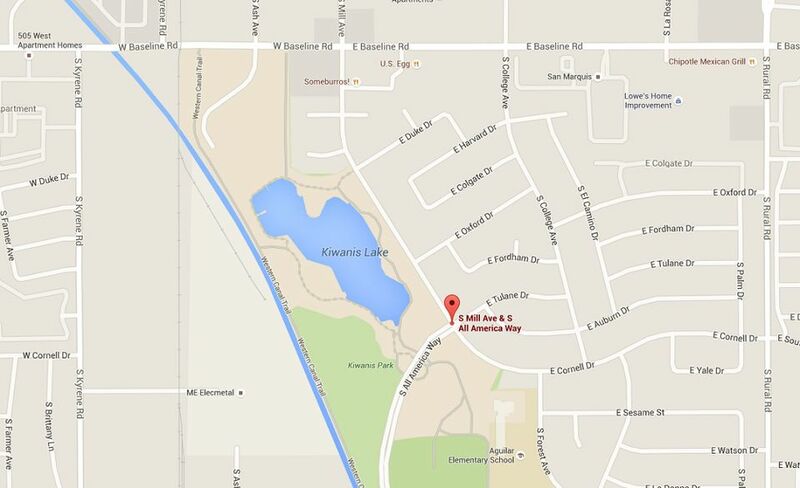 Note: Kiwanis Park does NOT have a Valley Metro Rail station within walking distance. From the north and west: take I-10 and exit at Baseline Road. Go east on Baseline to Kyrene Road, and turn right (south). Drive to Guadalupe Rd and make a left (east). turn left at All American Way into Kiwanis Park. From the east: Take US60 to Rural Road exit. Turn left (south) on Rural Road to Guadalupe Rd. Turn right (west) on Guadalupe Rd. to All American Way and turn right to enter Kiwanis Park. There are several parking areas at Kiwanis Park. Parking for both the recreation center/pool and the lake are accessible from All American Way.